The term revenue, also called “sales” or “turnover,” is simply the amount of money generated by a business from its operations, such as the sale of its products and services. It is sometimes called “top line” because it is the first item on an income statement (see the sample income statement above). Hunter Company, a company that focuses on wildlife guided tours owned by Thomas Hunter, had 1,000 student bookings for $500 each, 100 group bookings for $1,500 each, and 10 bookings for senior citizens for $300 each for the entire year. To calculate its revenue, simply add all the money received from the tour operations: $500,000 student bookings + $150,000 group bookings + $3000 senior citizens bookings = $653,000. Soap Good, a small online store that sells organic soap, sold 200 soap bars for $30 each for the entire month of May. The store’s revenue for May is $6,000. Although the most common source of revenue is the cash received from the sale of products and services, other companies get their revenue from stocks, bonds, investments, royalties, and interest. Non-profit organizations get their revenue from fundraising activities, membership fees, and donations from corporations, private individuals, and government. For the government, revenue usually means the fees and taxes received from its citizens. Revenue is undeniably a very important item on an income statement. It is the monetary figure from which the rest of the calculations are based. It can be used to measure a company’s performance in terms of the quality of its earnings. 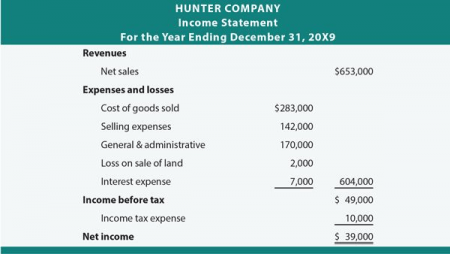 Hunter company earned $653,000 for the entire year, but its total expenses (see image above for details) was $614,000. The residual amount of $39,000 is its net income. Soap Good earned $6,000 for May alone but paid $1,000 for the utilities, $800 for labor, and $2,000 for the materials to make the soap. The remaining amount of $2,200 is its net income. Net income plays an integral role in a business analysis as it measures the profitability of a business. This means that if the company arrives at a negative amount after the expenses are paid, there is net loss instead of net income. This usually happens when the expenses are higher than the sales. Net income is usually distributed and divided among the company’s owners and stockholders. Companies may also choose to use the money for additional investments. What, then, is the difference between revenue and net income? Revenue, also called “sales” or “turnover,” is simply the total amount of money received by a company from its business operations (sale of goods or services), whereas net income, also called “net profit,” is the amount of money left after all expenses (such as cost of goods sold, operating expenses, loan interests, depreciation, tax, one-time fees) are deducted from the revenue. Both revenue and net income play an important role in a business analysis. Revenue indicates how much the company earned for a specific period, whereas net income measures the profitability of the business.